Aman Bassi is vice-president of strategic initiatives at GroupeX Solutions. Over the past 15 years, Mr. Bassi has been delivering, managing and designing HR solutions for customers across North America. He is also enrolled in the executive MBA program at the University of Toronto’s Rotman School of Management. Fresh out of four years in college with a diploma in computer science, I learned in my first job that I didn’t want to be a computer programmer. I thought to myself, I’ll work for a few years and then go back to school but, of course, like many people, I didn’t come back to pursuing my education. Instead of that traditional path to success, over my career I’ve taken the approach of expanding and building my skills through opportunities on the job. As a result, I found myself in a fast-growing company and quickly moved from consultant to project manager and then director, where I thought I had hit my ceiling. I felt I had reached a place in my career where my vision and ambition had grown bigger than my role in the company; yet I had a nagging feeling that, despite my experience and qualifications, my lack of well-rounded business knowledge would keep me out of the executive boardroom and be a roadblock to reaching the next level. 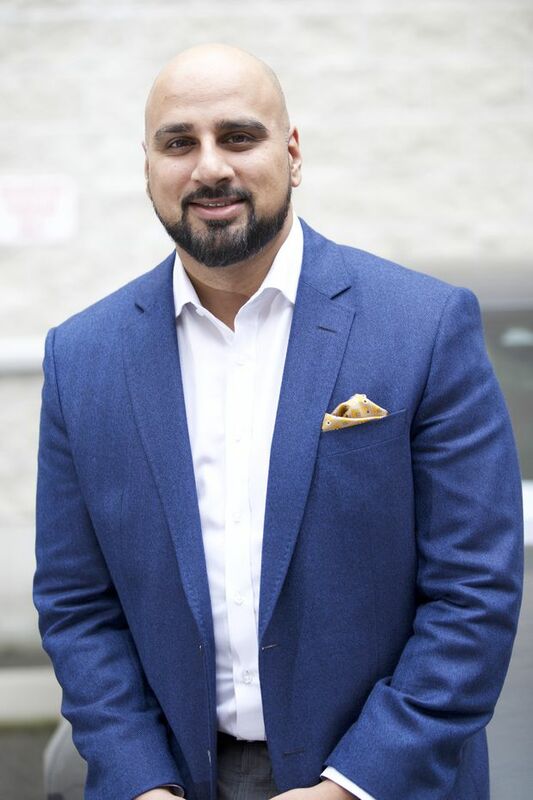 When his company went looking for new leaders, Aman Bassi realized this was his chance to step up his career. So he enrolled in Rotman's EMBA program. I was puzzled. I needed to do something to build the skills required to bridge the gap between a top performer and a true leader. I started questioning my old belief that I didn’t require more formal education to unlock my full potential. So what next? Luckily, I work for an organization that specializes in human resources and understands the benefits of learning and skills management as key attributes of maintaining an engaged work force. My company, GroupeX Solutions, while in the midst of a fast and aggressive growth phase, recognized that arming our organization with the skills to strategize, manage and lead would be paramount to our continued success. Rather than looking outward for leaders, GroupeX wanted to look inward and develop our in-house resources. I realized that this was my opportunity to close the gap on the skills I needed. I must admit, I’ve always been skeptical about executive education programs. However, after talking to some people in my network who had been through an executive MBA and hearing how it expanded their horizons, I decided to explore it further. A couple of months later I received the letter of admission from Rotman and I was excited, and a little nervous, to be starting my journey at a world-class school. The program offered me the flexibility I need to manage a demanding job and a rigorous business education. The school is conveniently located just minutes from our office and offers an intensive 13-month curriculum, allowing me to build my skills quickly. What I learned over the weekend, I would apply on Monday. For GroupeX, the program represents an instant return on investment. I am now approaching the finish line, and the company has already benefited from new strategies to manage operations and foster aggressive growth. For me personally, I have gained access to world-renowned faculty, who are more than willing to be a sounding board for my business problems and offer expert advice. I have also gained a group of peers who have gone through similar business challenges and are happy to share their experience in varied industries and provide fresh perspectives on my business. Most importantly, I have acquired the leadership skills to help define the vision for the future of GroupeX and translate strategy into plans. Seizing the opportunity to advance my education has truly been an exceptional experience that came with a network of professionals that I will keep far beyond the short time we have spent together in the classroom. It feels as though my full potential has been unlocked in just a few short months. Rotman’s executive MBA is surely a key reason for my recent promotion to vice-president of strategic initiatives and I am confident that I now have the skills to succeed at this level.